By	Peter Alexandrou. Last edited by Marios Alexandrou on October 11, 2018. While many people are very willing to help someone in need, others may have some serious apprehensions about helping. Most of their concerns are unfounded and would be alleviated by proper training. Training will not only give you the confidence to help someone in need, but also the tools to do it in such a way so you don't put yourself in danger. Removing barriers, whether imagined or real, is the best approach to dealing with emergencies. A bystander is someone like you who recognizes an emergency and decides to help. Ideally, everyone would know what to do in an emergency and everyone would know first aid; the immediate care given to a victim of injury or sudden illness until advanced care is obtained. Becoming involved in emergency situations, where you may be the only one who can help, is very important. Don't worry that you might make a mistake; you can always help in some way, even if it's only calling for help. The thing to remember is that first aid can make the difference between life and death. And it often makes the difference between complete recovery and permanent disability. Recognize an Emergency: A medical emergency is a sudden illness that requires immediate medical attention e.g. a heart attack. An injury is damage to the body e.g. broken arm, that results from a violent force. Some injuries can be serious enough to be considered emergencies. Decide to Act: Bystanders need to get involved in emergency situations and many lives have been saved because people like you do got involved. Call EMS: The sooner the better. Don't delay. 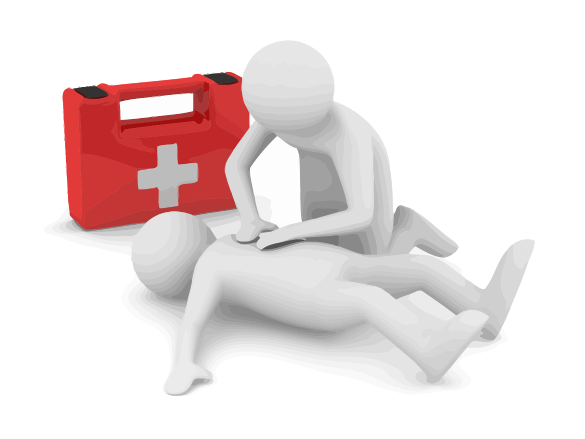 Give First Aid: Until the EMS is on the scene, you need to provide all the care you can to the person in need. The other person would have to have the virus. Their blood, other bodily fluid, would need to enter your body. Not just touch you on the skin. It would need to enter your bloodstream, which is extremely difficult. The virus would have to be in large enough quantities. Your immune system would have to miss it in order for the virus to take hold. Wear disposable gloves before touching the person. These gloves should be in every first aid kit. If you don't have any use any plastic barrier for your hands. Use a breathing barrier if you need to give rescue breaths. Again, these barriers should be in first aid kits. Ask a relative or family member, if they are nearby, to do any necessary touching. After the task wash your hands with warm soap and water. If by chance you did touch some blood do visit your family doctor right away for antibiotics and for monitoring. The average person, trained or not, walking down the street on his own time does not have a legal duty to help. However, once you stop to help you must continue to do so until someone equally or more trained takes over on your behalf. If you are a medical professional, such as a paramedic or a doctor, then you have a legal duty to assist to the best of your ability. If you are at your job, and it is part of your job description, then again, you have a legal duty to assist to the best of your ability. With a few precautions you can easily avoid any legal issues when dealing in an emergency. Employers, or even volunteer organizations, have a legal duty to be able to provide first aid to all workers regardless of the type of work they do or the location. This means the employer must ensure that enough employees are trained, the training is current, and that they supply well stocked and maintained first aid kits. In some situations employers must provide a first aid room and a full-time nurse on the premises. When Automated External Defibrillators (AEDs) first became available many people were quite apprehensive about using them. However, as their popularity increased and more and more people obtained training, that apprehension is almost totally gone. Having an AED on the premises, whether it be the workplace, an airport, or a shopping centre is no longer considered an ‘extra.' It is, in many cases, now a legal requirement, along with trained staff. An organization can no longer say, “I didn't know we had to have this.” It is their duty to provide this medical service to anyone on their premises. Getting trained or providing training if you are in charge at your organization is only part of the program. Recertification and regular practice sessions are necessary. Not only as a legal requirement but to keep the skills fresh and up to date. It doesn't take much, but it does require monitoring and planning on the part of the person responsible. Have the necessary equipment to assist during a first aid emergency is vital. In addition to the training, an organization must make sure they meet the legal requirement for first aid kits. This will depend on the size of their organization, how many floors there are in their building, number of workers per shift, etc. The list of supplies will vary pending on various factors, so check with your local Workplace Health & Safety Board, or with your local first aid providing company for more information. No need to ask for consent! As long as the child is in immediate distress, or it’s vital functions or life is threatened. You have an obligation to help. If the parents deny you, they will be in big trouble with the law for doing that, most likely loose custody of the child. You are also protected under the Good Samaritan law. The 1996 Federal Emerson Act was intended to encourage donations of food and grocery products that meet quality and labeling standards imposed by federal, state and local laws and regulations, by protecting the donor and the recipient agency against liability, excepting in the case of gross negligence and/or intentional misconduct. Prior to passage of the Emerson Act differences in language and applicability between states often discouraged national and regional companies from donating, resulting in otherwise usable food being sent to landfills. When it comes to First Aid and a child what steps should the responder take when it comes to liability issues, and how should the responder act? Do we have to ask the parent for consent? Do we ask the child for consent? Thanks.